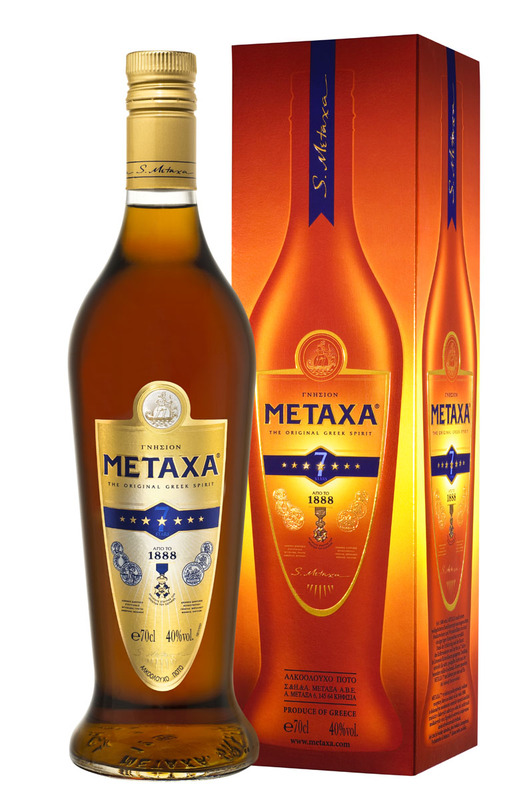 Metaxa 7 Stars (40%): Without a doubt Metaxa is the most famous spirit originated from Greece after Ouzo. The brand is created at the end of the 19th century by a Greek merchant named Spyros Metaxa. My first memories about the brand is from my childhood watching my father occasionally taking that gorgeous bottle from his cabinet to sip with my aunt after family dinners. He was born and raised in Greece after all, so I guess it was in his genes. Contrary to popular belief standard expressions of Metaxa are not brandies but liqueurs. The process starts with dry white wines from different regions of Greece made both from fresh grapes and raisins. They are distilled and aged in French Limousin oak barrels for a period of time. Then a small amount of rich, sweet muscat wines sourced from Samos and Lemnos islands are blended with the aged spirits and finally a secret mix of herbs and floral extracts containing rose petals is added. This unique process makes Metaxa a liqueur rather than a brandy. The brand has a wide range of products: 3 stars, 5 stars, 7 stars, 12 stars (stars refer to the age of the youngest distillate in the vat) and a Reserve Collection with Metaxa Private Reserve (30 yo) and Aen Metaxa. Aen Metaxa contains aged spirit sourced from their Cask Number 1 also known as "Spyros Cask" which according to their press release holds some brandy older that 80 years old. Now isn't it a bottle to secure a firm place in anybody's bucket list? I am adding it right now to mine... Color: Dark amber with visible thin legs. The labels says that it contains caramel coloring though. Nose: Peach compote, candied pecans and honey raisin bread. Very sweet and perfumy. Rich milk chocolate bars, Tokaji wine, golden raisins, rose water, quince jam and cloves. Palate: Very oily mouthfeel. Sweet quinine liqueur, elderflowers, rose jam and cooked dried apricots. Chestnut honey, ripe black mission figs and cinnamon dusting. Finish: Long with sweet spices and baklava syrup. Overall: A little too sweet but gentle and one of its kind. It has such a unique flavor profile, unlike anything else. As soon as I sip it I feel the calm and cool Mediterranean breeze at a summer night. Imagine: You had your amazing Greek dinner, took a short walk along the harbor of the small Greek island and sat down at a cafe right next to the water. All you want to do is to order your Greek coffee without sugar, a glass of Metaxa and watch the moon sinking into the sea. There is no better pairing I know... Greek coffee and Metaxa are meant to be together. I can imagine that it might taste a little off to regular brandy and whisky drinkers for the first time but like I said before Metaxa is not a spirit you can compare it with anything else. It has its own character in a beautiful way.